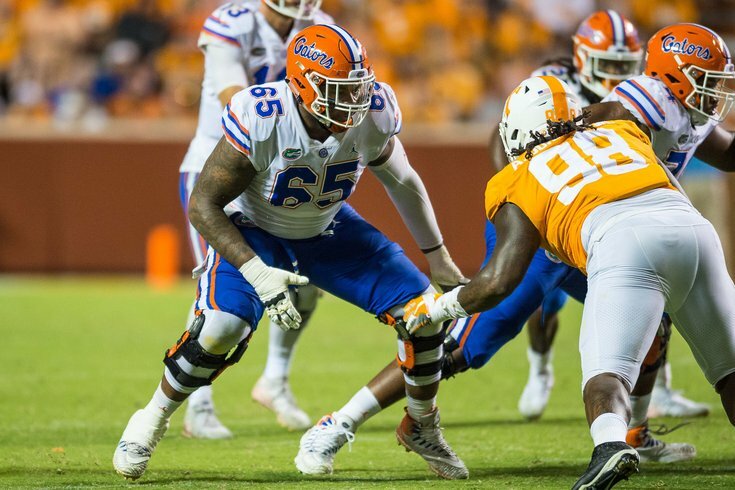 Florida OT Jawaan Taylor is a mauler in the run game. • Lane Johnson: Johnson is easily the best right tackle in the game, and one of the best offensive linemen overall. Offensive linemen aren't often considered star players, but he is one. • Jason Peters: Peters started all 18 games in 2018 (16 regular season, 2 playoffs), but he still missed 20 percent of the snaps, and he missed at least one snap in 11 games. Last year, Peters was coming off an ACL tear at the age of 35, and he admitted that it was still barking at him during the season. In addition to the recovery from that ACL surgery, Peters suffered an assortment of other injuries, including a quad injury, which may have occurred because he was favoring one leg over the other, which is common for players coming off major surgery. Will Peters' penchant for coming out of games accelerate at the age of 36, or will it stabilize a bit another year removed from his ACL surgery? To be determined. • Halapoulivaati Vaitai: Vaitai is a valuable swing tackle, capable of playing both LT and RT. Peters' recurring theme of leaving games early kept Vaitai busy, and he had the unenviable task of coming in cold, mid-game. He is scheduled to become a free agent in 2020. • Jordan Mailata: Mailata is such a wildcard, because the Eagles' first preseason game eight months ago was his first game, ever. Like... ever. Mailata's growth from the first day of training camp to the final preseason game was unlike anything I've ever seen in the NFL. He is a size-athleticism freak of nature with a high ceiling, but obviously, he is such an unpredictable projection, having only begun playing football in 2018. • Matt Pryor: Pryor was very impressive in Eagles training camp, while playing both at right guard and right tackle. He was not so impressive in the Eagles' preseason games. Still, there's upside with Pryor, who has versatility that the Eagles covet, and should be improved in Year 2. • Isaac Seumalo: And then of course there's Seumalo, who is the team's starting left guard, but who has appeared at tackle in emergency situations for the Eagles in each of his first three seasons in the NFL. The decision to bring Peters back for one last season was a debatable one, but one that allowed the Eagles to avoid a severe need this offseason at offensive tackle. By bringing Peters back, they will not have to rely on Vaitai to start (barring injury), they can let Mailata develop behind the scenes for another year, and they will not have to reach for an offensive tackle in the first round of the draft. In 2019, the Eagles are set at offensive tackle. They have as good a situation on the edges as any team in the NFL, in my view. In 2020, and beyond, there is uncertainty at LT, and the OT depth. If Mailata proves that he can be the heir apparent to Peters this year, then the Eagles are set. If not, they could be forced to dump highly valuable resources into the position next offseason. There isn't any room on the roster for a player who only plays tackle, unless they were to keep an abnormal number of them. On a championship-caliber team, that will be hard to do. As such, if the Eagles were to draft an offensive tackle, it would be ideal if he also had guard versatility, or at least LT-RT versatility, simply so that he could fit on the roster and have an immediate purpose. Taylor is a mauler in the run game, and good in pass protection, but with room to grow. He also has LT/RT versatility, though his experience at LT is minimal. Here he is working (at times) against stud Kentucky pass rusher Josh Allen. Taylor is a sure-fire first rounder, and it's interesting that a report surfaced that he was visiting the Eagles for one of their 30 allotted pre-draft visits. If he fell to 25, the Eagles would have to be interested, if for no other reason than a value play. Taylor could start at guard in the short term, with the idea that he would eventually kick out to tackle at some point, almost like Shawn Andrews back in the day. And if he just stays at guard, fine. He is a player similar to Isaac Seumalo, in that he can play all five spots along the offensive line. Many believe his future at the next level is at center or guard. Others believe it is at offensive tackle. With Peters almost certainly heading into his final season and Jason Kelce confirming that's he's essentially year-to-year going forward in the NFL, Risner gives the Eagles a future starter along the interior of the offensive line, wherever he may be needed. The Eagles brought Howard in for a pre-draft visit, but it should probably be noted that the Eagles' interest in him appeared to occur before Peters agreed to a pay cut. Howard is an athletic project, and likely wouldn't help much early on. He would essentially be another Mailata, but necessitating a more valuable resource to get him. With Vaitai heading into a contract year in 2019, Scharping would make sense as a player who could step into his role in the short term, with a chance to develop into a starter down the line. Like Lane Johnson, Edwards was a former quarterback, as he ran the option in high school at 215 pounds. He enrolled at Wisconsin as a tight end, but moved to right tackle. As you might imagine, he is an athletic tackle who excels at getting to the second level in the run game, as well as mirroring and matching as a pass protector, though his Combine numbers would say otherwise. Edwards' fit with the Eagles is questionable. One of the new trends in the NFL is that right tackles are beginning to be viewed as having importance similar to left tackles, because of the number of elite pass rushers primarily lining up against the right tackle. The Eagles will likely opt to just leave Johnson at RT when Peters retires. Typically, the Eagles like their OT prospects to have experience both at LT and RT, and Edwards has only played RT. Edwards would be forced to learn a new position, which isn't impossible, and something he is used to, but it's one extra obstacle. He would certainly have time to learn, and his skill set fits nicely within the Eagles' scheme. Edwards is a tackle only, and the Eagles would have to feel comfortable occupying a roster spot for a guy they would likely have inactive every week, barring injuries.